Today, Homes For Our Troops (HFOT), a nonprofit that provides adapted homes for severely injured post-9/11 Veterans, announced its Veterans Day Celebrity campaign lineup. Cher, George Clooney, Ben Stiller and Jake Tapper are among the notable celebrities bringing their star power together to support HFOT’s noble cause. 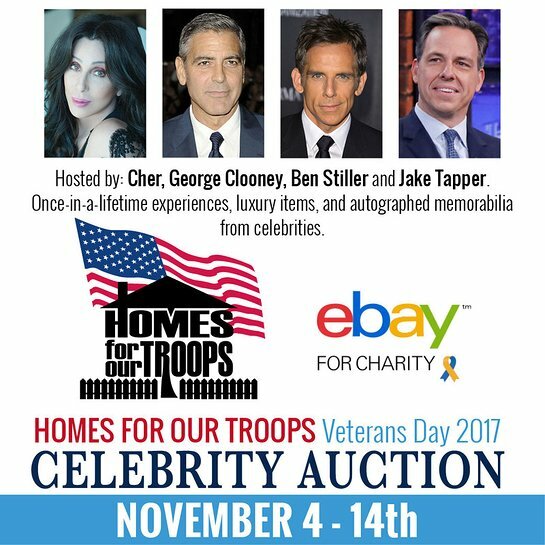 Offered through eBay for Charity, bidding for this special online event will go live on November 4, 2017 and close on November 14, 2017 at eBay.com/homesforourtroops. 100% of the proceeds will benefit Homes For Our Troops. The eBay for Charity campaign will give shoppers the opportunity to bid on once-in-a-lifetime experiences, luxury items and autographed memorabilia from various movie stars, musicians, and sports figures, while helping the nonprofit’s mission to build adapted homes for injured Veterans. To amplify the reach of this auction, the celebrity participants are harnessing their influential networks by rallying the support of close friends, including other celebrity and entertainment icons, to arrange an extensive assortment of exclusive auction items for this Veterans Day cause. TV star Ellen DeGeneres has donated a pair of autographed sneakers, and Dallas Mavericks owner and entrepreneur, Mark Cuban, has donated pairs of courtside tickets to future Dallas Mavericks games, along with a photo op at center court. Talk show hosts Conan O'Brien, Stephen Colbert and Seth Myers have all donated tickets, along with Jimmy Kimmel who also threw in a VIP green room experience, show swag, and a chance to drink tequila with Guillermo before the show. Other coveted donation items include: an autographed cast poster from the Broadway smash, Hamilton, donated by Lin-Manuel Miranda; a pair of pink cowboy boots from Cher; a Game of Thrones poster signed by the cast; and a deluxe golf bag autographed by George Clooney. Additional celebrities contributing to the cause include Paul Rudd, Henry Winkler, Owen Wilson, and Whoopi Goldberg. CNN’s Jake Tapper has been an ardent supporter of the Massachusetts based nonprofit for over three years, raising funds on its behalf through the network’s Presidents Day Quiz Show. In 2016, Tapper partnered with comic strip, “Dilbert,” and acted as guest artist for a series of daily comics. The originals were sold on eBay for Charity and the proceeds benefitted Homes For Our Troops. For more information about Veterans Day Celebrity Auction, please contact eBay.com/homesforourtroops For more information about HFOT, please visit www.hfotusa.org.